High Tea at Patisse is the last Sunday of each month. Even though I was late in booking my reservation and the web page said they were full, we were fortunate enough to get reservations for Sunday, October 30. We’ve watched Executive Chef Vincent Gadan on Masterchef Australia and the desserts he made were beautiful and sounded so delicious that we couldn’t pass up the opportunity to go for tea. 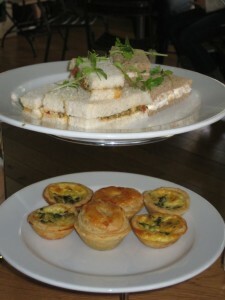 Now this isn’t your usual British High Tea with scones and cucumber and egg salad sandwiches. This was a hearty High Tea and I left feeling stuffed and very satisfied. I’m wondering now if this is the way of High Tea in Australia. Patisse is the only one we went to, though I think I would be the person that would be at High Tea all the time if it were available in my area. We started with our selection of tea; I had a pot of Chai tea and Ken had Lemongrass tea. We were brought out plates with finger sandwiches of chicken salad and roasted vegetables. Another plate had spinach and feta quiches and Wagyu beef pies. The roasted vegetable sandwich and Wagyu beef pies were my favorite. The beef filling was juicy and tasty and the puff pastry enclosing the filling was crisp and melt in your mouth. Ken ate all of the little quiches since he doesn’t eat beef and he really liked the flavor. Then the dessert board came. I was in heaven just looking at the three selections. It’s true you eat with your eyes. I think I gained calories just looking at these pastries. After eating the very satisfying sandwiches and beef pies my stomach was close to full. This was not a tray of miniature pop in your mouth treats, these were generous and I had three of them to myself. This felt sinful! It was a tough decision of where to begin. I like to decide which will be my favorite and save it for last. I started with the White & Milk Chocolate Valrhona Paddlepop. I am not a white chocolate fan so I went for what would be my least favorite. 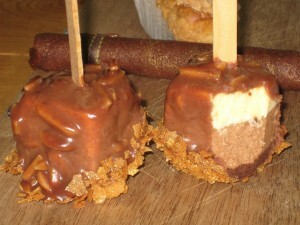 This is three layers of chocolate mousse; dark, milk and white, dipped in milk chocolate and almonds. I think the layer of crunchy at the very bottom outside was a caramel crunch. This was yummy! I loved every bite and would never have known I was eating white chocolate. Next I went for the little Vanilla Éclair. It was filled with a vanilla bean pastry creme and topped with a caramelized white chocolate. Caramelizing white chocolate is a tricky process, I’ve watched them do it on Masterchef Australia. It gives the white chocolate a nutty flavor. After this I can say that I have changed my mind about my dislike of white chocolate. 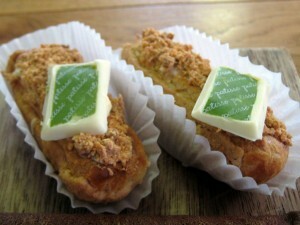 Patisse is a master at preparing it and now I’m sure I must have had poor white chocolate in the past. 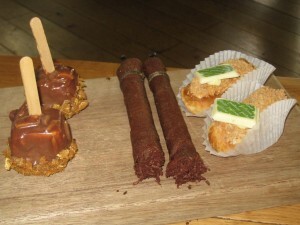 The final dessert for me was the Dark Chocolate Mousse Cigar. It arrived at the table with smoke coming from the end of it from a little piece of vanilla bean stuck in the end and lit. The chocolate was smoked over pine needles. The outside of the cigar was a thin, crisp layer. Perhaps like a chocolate filo. 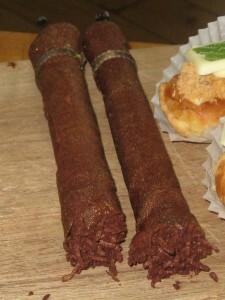 The end of a cigar was a chocolate coconut. At the end the Sous Chef, Robert Nyman, came out an described all of the desserts that were served and I thought that was great. It’s nice to see the person responsible for all the hard work and beautiful food. I would have loved to sit down with him and ask more questions and get more details but I’m sure he was very busy. 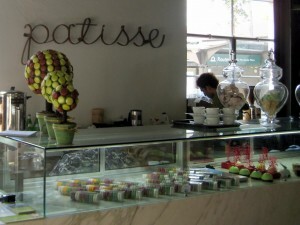 Patisse serves breakfast and lunch and is in an unusual location in the Waterloo area of Sydney. They’re located in the pyd. 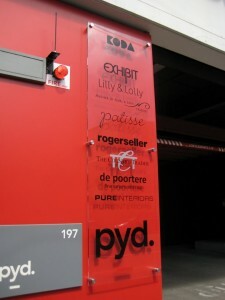 building which is a design center filled with stores selling furniture and unique home decorations. Don’t let this unusual section of town and location put you off. The beautiful desserts at Patisse fit right in. It’s well worth the trip. NOTE: If you’re part of this establishment and I’ve made an error in describing something please let me know by email of comment on this article. I am frequently so involved in the flavors of the food that I remember something incorrectly when writing about it.